From 7/2014 through 6/2015, 10 emergency department (ED) medication dosing errors were reported through the electronic incident reporting system of an urban academic medical center. Analysis of these medication errors identified inaccurate estimated weight on patients as the root cause. 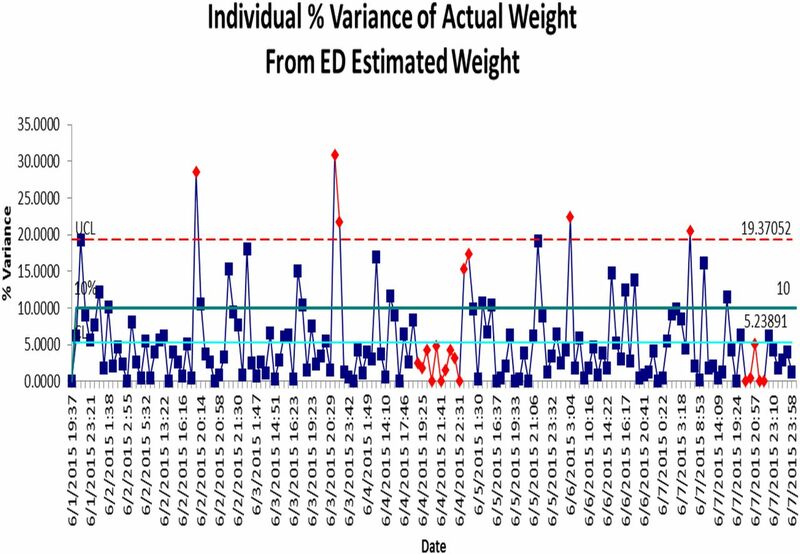 The goal of this project was to reduce weight-based dosing medication errors due to inaccurate estimated weights on patients presenting to the ED. Chart review revealed that 13.8% of estimated weights documented on admitted ED patients varied more than 10% from subsequent actual admission weights recorded. A random sample of 100 charts containing estimated weights revealed 2 previously unreported significant medication dosage errors (.02 significant error rate). 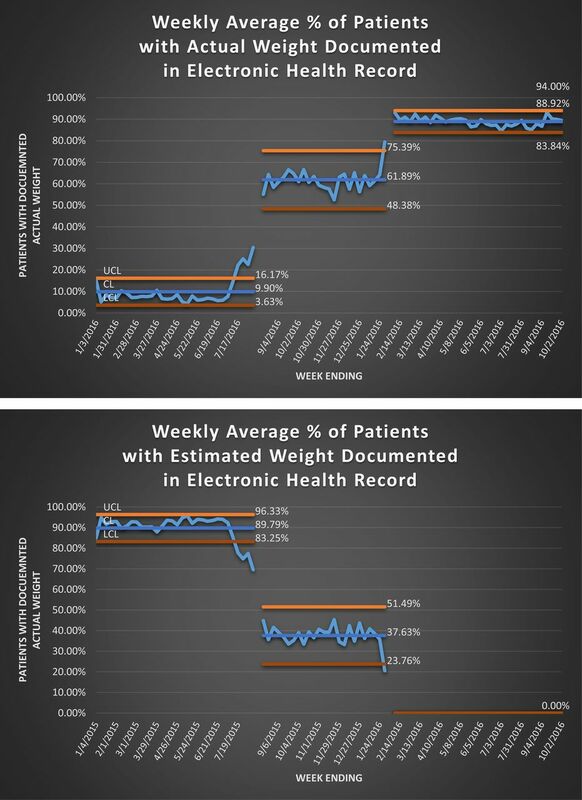 Key improvements included removing barriers to weighing ED patients, storytelling to engage staff and change culture, and removal of the estimated weight documentation field from the ED electronic health record (EHR) forms. With these improvements estimated weights on ED patients, and the resulting medication errors, were eliminated. In our US urban tertiary care hospital, with an annual emergency department volume of 70,000 visits,10 medication dosage errors related to patient weight were reported in the electronic incident reporting system from 7/2014-6/2015. Investigation revealed the root cause was an inaccurate estimated weight documented in the ED. All 10 medication errors were found to be significant with four representative errors shown in table 1. All 10 errors were felt to be avoidable and an unacceptable patient safety problem for our institution. The project team included nursing, physician, pharmacy, and patient safety representatives. Our goal was performance consistent with best practice recommendations, which included elimination of estimated weights (zero tolerance) in the ED within 6 months. This was felt to be a specific, measurable, attainable, realistic, and timely goal (SMART aim). Decreasing medication errors by removing estimated weight as a source of error is consistent with our strategic goals to create great patient outcomes, as well as our vision to be a national leader for excellence in patient care. Baseline measurement of the accuracy of estimated weights included all 726 patients seen in the ED in June 2015 with an estimated weight documented and actual weight later documented on admission. Estimated weights varied an average of 5.63% from actual weight later obtained when the patient was admitted. 13.8% of these patients had an estimated weight documented that varied more than 10% from later measured admission weight, which was used as a threshold for clinical significance. This variance is illustrated for one representative week in Figure 1. This translated into 138,000 defects per million opportunities, or a Z score of 2.6. This variance was felt to be a clinical risk meriting further data analysis. 100 random charts were reviewed from the N of 726, with selection generated by a statistical analysis program (Minitab). These randomly selected patients were evaluated for bias by comparison to the total ED population for that month. There was no statistical difference in gender or All Patient Refined-Diagnostic Related Groups (APR-DRG). Comparison of age did demonstrate the random sample to be different than the base population, with a median of 67 vs. 69.5 years of age, but the writers believe the difference to have no practical implication. 60% (60/100) of the randomly selected patients had a weight based medication prescribed based on estimated weight. 2% (2/100) charts had significant errors related to inaccurate estimated weight; 1) antidote underdosing for an acetaminophen overdose, and 2) overdosing vancomycin and fluid resuscitation for a patient presenting with sepsis. Of note, both of these dosage errors found on chart review were previously unreported. Interventions were chosen using a Lean Six Sigma DMAIC (Define, Measure, Analyze, Improve, Control) project structure, and utilizing tools including Critical-to-Quality Tree and Work flow process mapping. Fishbone diagrams and 5 whys analysis revealed current barriers and “critical X's” to obtaining actual weight. Critical factors included: 1) ED stretcher scales that didn't always work, 2) an ED culture that accepted estimated weight in the ED as safe, and 3) a mandatory weight field in the ED triage form allowing entry of either estimated or actual weight. An informal effort/impact matrix was used to evaluate the usefulness and timing of interventions suggested by the team. The ED nursing staff were seen as the key stakeholders in the improvement process, and their buy-in and commitment would be required for success and sustainability. The improvement phase of the DMAIC process occurred in 3 stages. The first intervention was aimed at increasing actual weights obtained at triage. Interventions included moving a standing scale to a more readily accessible location in the triage area, and ED nursing leadership setting the expectation that when safe to do so, patients presenting to triage should be weighed. This increased the percentage of actual weight obtained from 19% to 50%. In the next 4 months, Engineering evaluated why some stretcher scales were not working, and implemented effective service and preventative maintenance schedules. Patient Safety worked with ED Nursing Leadership to communicate to staff the impact of inaccurate estimated weights. Telling the stories of the medication errors caused by estimating a weight created a sense of urgency and the commitment needed from ED stakeholders. ED staff developed processes for ambulance patients to be weighed when first placed on the stretcher, and for trauma patients to be weighed after CT scan, when the backboard was typically removed. These interventions increased actual weight documentation to 60%. Although this represented a significant improvement, it did not meet the SMART goal of eliminating estimated weights. The last improvement step was removing the estimated weight field in the ED electronic forms. Only actual weight field is now available, with highly visible instruction to document only actual weights, not estimated, as seen in Figure 2. Documentation of estimated weight fell to 0%, since the field was no longer available, and over 90% of ED patients had an actual weight documented. Documentation of actual weight for any patient seen in the ED patient has risen from 19% to 91%, seen in Figure 3. 10% of our ED patients do not have a weight documented, but with the elimination of the field in the electronic form, estimated weights are no longer a possible entry. This “forced function” has been the key to sustainability of this best practice recommendation. Our interventions focused on improvements in manpower, machinery and method. Our initial improvement efforts involved ED leadership setting the expectation that an accurate weight be obtained by triage personnel whenever possible (manpower) and the availability of a scale at triage (machinery). The second phase of improvement focused on reliability of ED stretcher scales (machinery). These efforts had significant results but did not eliminate inaccurate estimated weights. The final improvement effort involved eliminating the ability to enter an estimated weight into the electronic medical record (method). This is an example of “poke-yoka”; eliminating defects by preventing human error, in this case the estimation of weights. It is still possible to enter no weight in our electronic medical record, and this still occurs in about 10% of our emergency department patients. However, whenever a weight based medicine is administered, an actual documented weight is required eliminating medication errors due to inaccurate estimated weights. Our results highlight the value of structuring processes to eliminate the possibility of making a specific error, in this case inaccurate estimated weights. Our project was done at a single Level I trauma center. Besides being a single center project, there are some other possible limitations limiting generalizability. One area of possible bias was that charts were reviewed for medication errors by a single pharmacist. It is possible other reviewers may characterize errors differently. Charts were picked for review by a software generated random number generator. There is the possibility these charts were not a true random representative. A possible confounder was a concurrent independent team tasked with improving the accuracy of inpatient weights during our project. This was a coincidence and no members were working on both teams. It is possible that differences in emergency department patient populations limit generalizability, especially in our estimation of the impact of inaccurate weights on medication errors. It is also possible an emergency department culture that already actively discourages estimated weights will not see the improvement we were able to demonstrate. Our control plan focuses on percentage of ED patients with a documented actual weight and compliance with preventive scale maintenance, specifically battery replacement. Of note, during the control phase a short term decline in percent of patients with actual weights documented was noted. Upon investigation, stretcher scale malfunction was discovered and corrected with resolution of the decline in actual weights recorded. Compliance in obtaining actual patient weights has now been sustained for over 10 months. The application of Six Sigma methodology resulted in sustainable change that eliminated medication errors resulting from inaccurate estimated weight. Removing barriers to obtaining weights at triage and implementing preventative maintenance schedules resulted in initial improvements. Removing estimated weight as an available documentation field eliminated the ability to document an estimated weight. The control plan focuses on percentage of ED patients with a documented actual weight and compliance with preventative scale battery replacement. Increasing compliance in obtaining actual weights is a sustainable change meeting best practice recommendations.
. (2009). Weighing in on medication safety. Journal of Emergency Nursing, 35, 553–555. Pennsylvania Patient Safety Authority (2009). Medication errors: significance of accurate patient weights. Pennsylvania Patient Safety Advisory, 6, 10–15. Declaration of interests None declared. Ethical approval This submission has been reviewed by the local institutional review board and was found exempt. This review board determined that this project was not research involving human subjects.